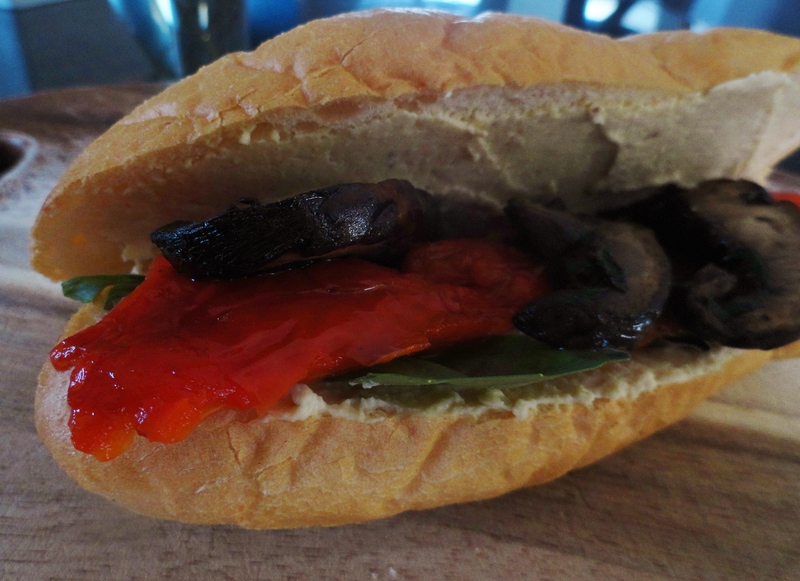 I must say, it was wonderful, but I sure wish I had more Portobello, because not only does the hoagie look slightly un-plump, but I could have really used a little more veg and less bread. Don’t get me wrong, the entire thing was wonderful, but I wouldn’t have been upset with more mushrooms. Who could be? 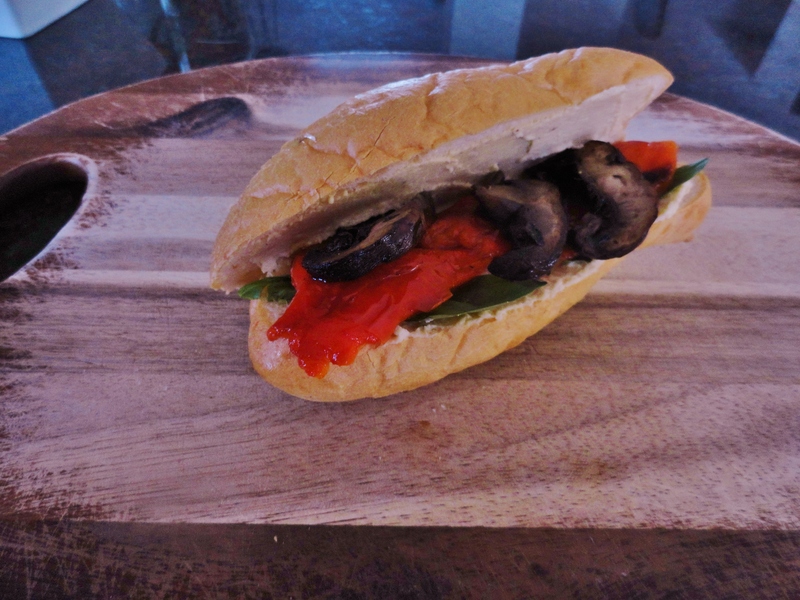 I roasted my own peppers for this sandwich (soups easy), as well as used homemade hummus. Feel free to speed up the process with jarred roasted red peppers and/or pre-made hummus. This was another vegan try for the baby shower, and while I think taste-wise this was my favorite, it would be too difficult to keep warm and leave out for several guests. So, I’ve decided on the Hummus Supreme! But go ahead and give this one a try too. I made this when it was still freezing in MN, which wasn’t too long ago, so I didn’t grill the Portobello. I just sautéed them in some olive oil quickly on the stovetop. 1. If grilling, preheat grill to medium high heat. Brush mushrooms with olive oil, and grill until just tender, about 2-3 minutes on each side. Remove from heat, sprinkle with salt and pepper, and let rest. Slice into 1/2-inch strips. If you are using your stovetop, Slice mushrooms into long strips, about 1/2-inch thick. Preheat olive oil in a small skillet over medium high heat. Add mushrooms and cook over moderate heat until just softened, about 5 minutes. Remove from heat and let rest. 2. Meanwhile, divide hummus evenly and spread on both sides of bread. Layer with basil leaves, roasted red pepper and sliced Portobellos. Close and enjoy! I love chicken salad. But this is one thing that I’m particularly picky about. I don’t like fruit or nuts in my chicken salad, though I do enjoy a crunch, which is where the celery comes in. Certainly, if you enjoy fruit or nuts in your chicken salad, feel free to add at your own discretion, but purely against my strong recommendation not to. This is another recipe I tried for the aforementioned baby shower – I’m sorry, you’ve heard so much about this in the last few weeks. The pairing of tarragon and chicken salad were of my own genius, but I wanted to find a great basic recipe for the chicken salad itself. 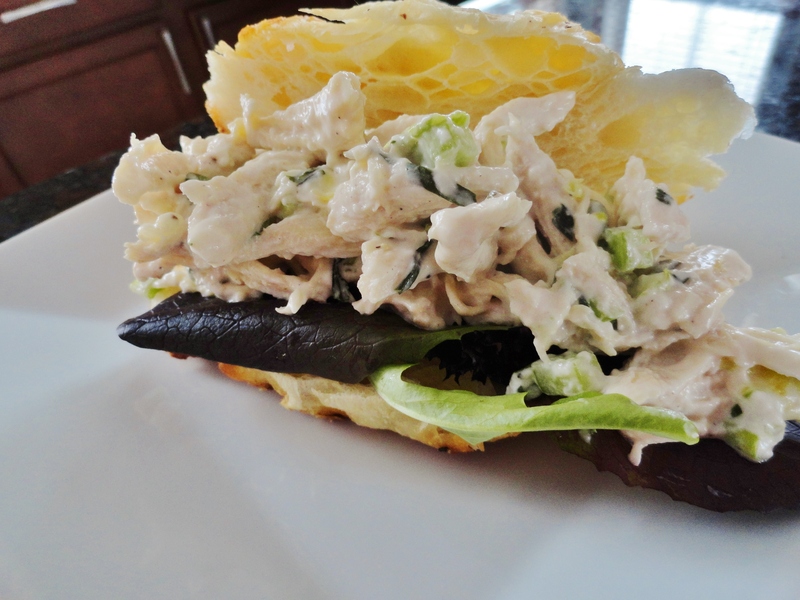 This recipe comes from Note to Self, and claims to be the absolute best chicken salad, ever. So I had to try it. I just subbed the tarragon for the dill. I really enjoyed it! I think this salad goes well on a buttery croissant because of deep tarragon flavor, but it’s just as good on wheat, white, pita or even on a salad. 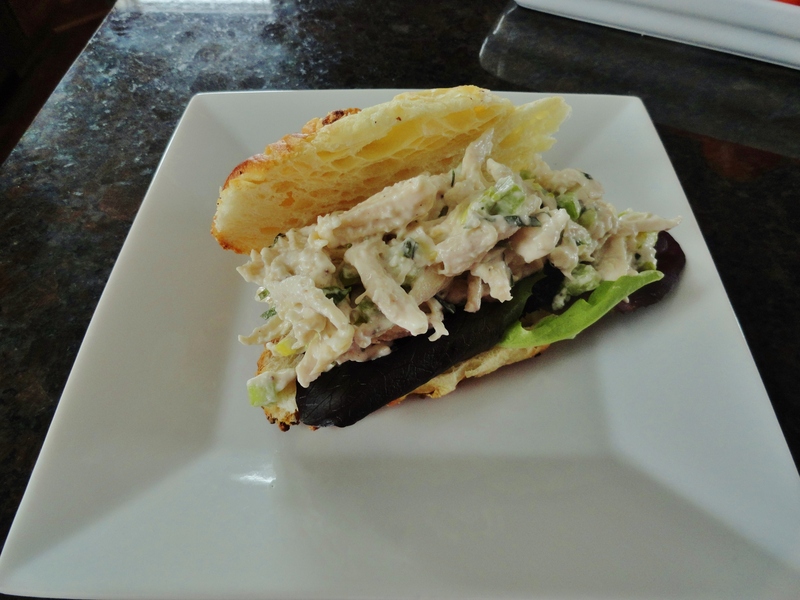 This is certainly not your ordinary chicken salad, and I love that! 1. In a large bowl, combine all ingredients. Add additional mayonnaise to desired consistency and adjust seasonings to taste. Refrigerate at least one hour before serving. I am getting really tired of this winter. All these veggie sandwiches makes me excited to start planting my garden and having fresh produce at my fingertips daily! But alas, it’s still awful cold out 😦 To try to get into the spring state of mind, I wanted to try another veggie option for my friend’s baby shower, and this time, it’s a roasted wrap! This takes a bit longer than the hummus supreme sandwich, as you have to first salt the eggplant and let the excess water drain, then wait for the vegetables to roast 😦 But don’t worry, the wait is worth it. The veggies are soft and sweet and the arugula adds a little crunch and extra freshness. 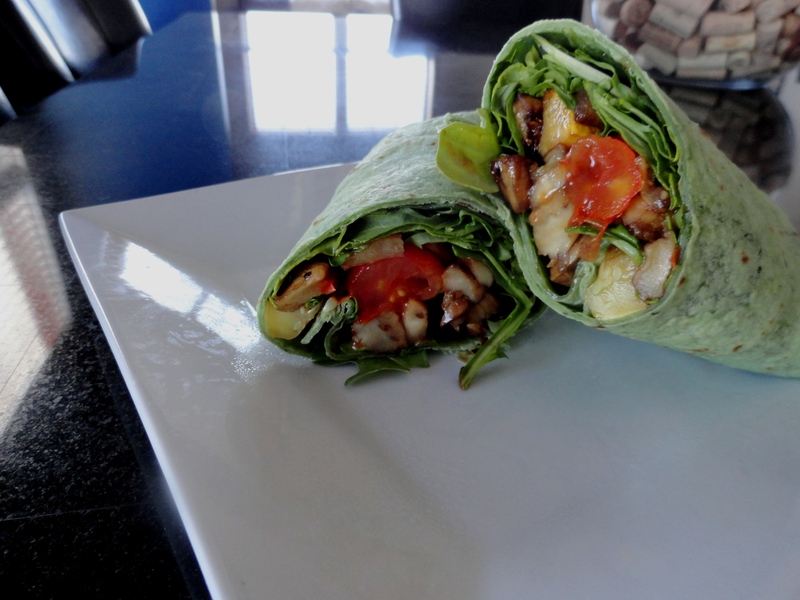 I would make a large batch of the roasted veggies so you can have this wrap every day for lunch, ready to go. Cold or warm, it’s delicious. You could use lavish, pita or tortilla wrap, like I did. 1. Preheat oven to 400 degrees. Prepare baking sheet with foil and spray with cooking spray. Place diced eggplant in colander and sprinkle generously with salt. Toss to coat evenly. Set over bowl or sink and let sit for 10-15 minutes. Excess water will begin to drain from eggplant. 2. To a large bowl, add eggplant, zucchini, cherry tomatoes and mushrooms. Drizzle with olive oil and half the vinegar. Add salt and pepper and toss to coat evenly. Transfer vegetables to prepared baking sheet and bake for 30-40 minutes. Halfway through, flip vegetables. With 5 minutes remaining, drizzle additional vinegar over vegetables. Remove from oven and cool slightly. 3. 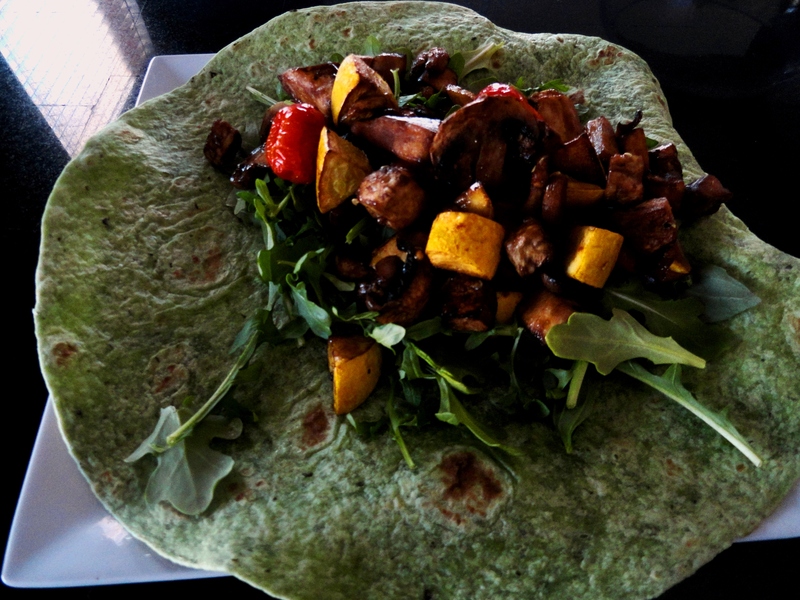 Divide basil and arugula among tortilla wraps, and top with roasted vegetables. Wrap as desired and enjoy! Do you ever get sick of your same old boring lunch? Maybe not. But maybe you want to try something new, possibly a little healthier or fresher than that café in your building that serves pre-wrapped sandwiches. Do you even know when those sandwiches were made? 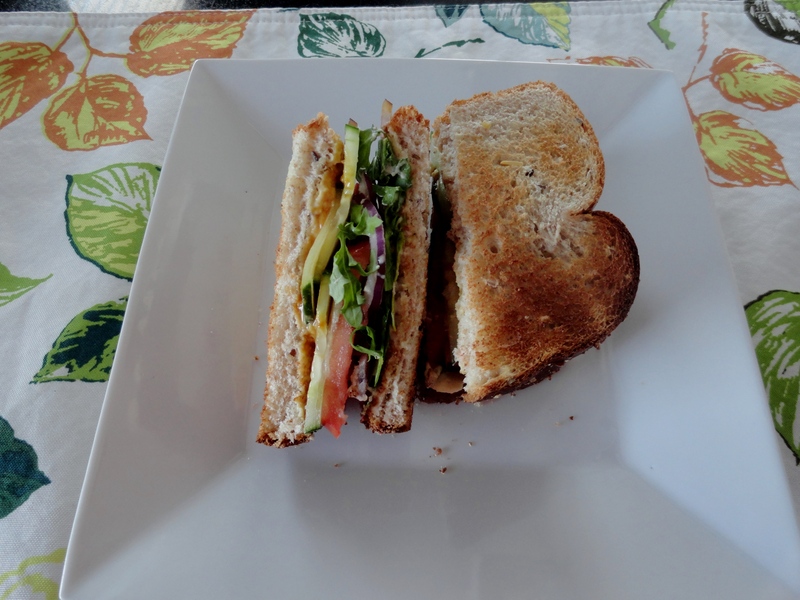 I wanted to try out a few vegan sandwich recipes to serve at my girlfriend’s baby shower in a few months. Yes, I’m already planning! One of the best things about this sandwich is that there is absolutely no cooking. Use store-bought hummus if you like to make this even quicker (I made a classic creamy hummus, though a roasted red pepper hummus would be fantastic!). I also used a store-bought 8-grain bread, but this would be even better with a thick cut gourmet bread. Don’t forget to lightly salt your veggies before assembling your sandwich; you wouldn’t believe how much of a difference it makes. The original recipe calls for pomegranate molasses, but my grocer didn’t carry it, and I didn’t want to make a special trip to find it. 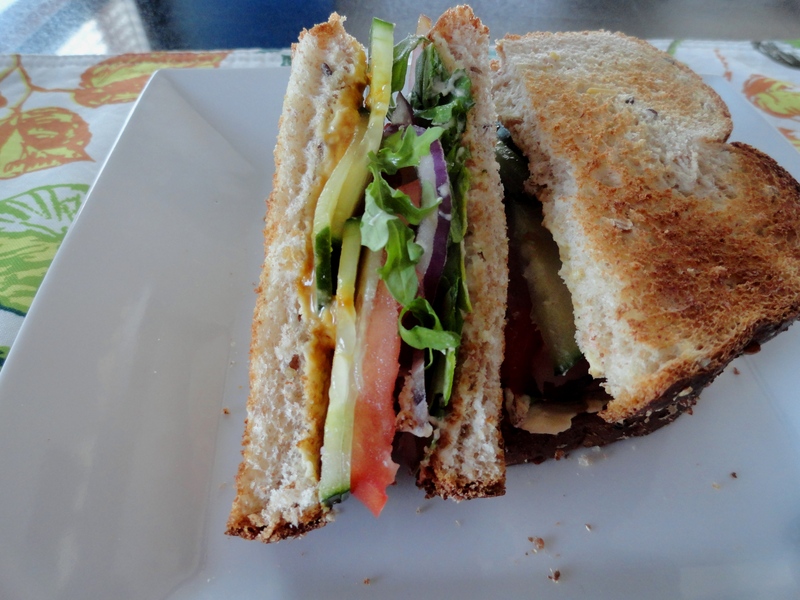 I just went with regular molasses, and I thought this sandwich was absolute heaven! Even Nate liked it, so don’t be afraid to feed it to your meat loving kids or hubbies! The thinly cut crisp veggies paired with the smooth savory hummus is awesome. The drizzle of molasses really brings it all together and knocks it out of the park. I know it sounds a little weird, but trust me – it adds SO MUCH with just a tiny drizzle. 1. Lightly toast bread (this is optional, but I like a little crisp and warmth in my bread). Spread each slice with hummus. 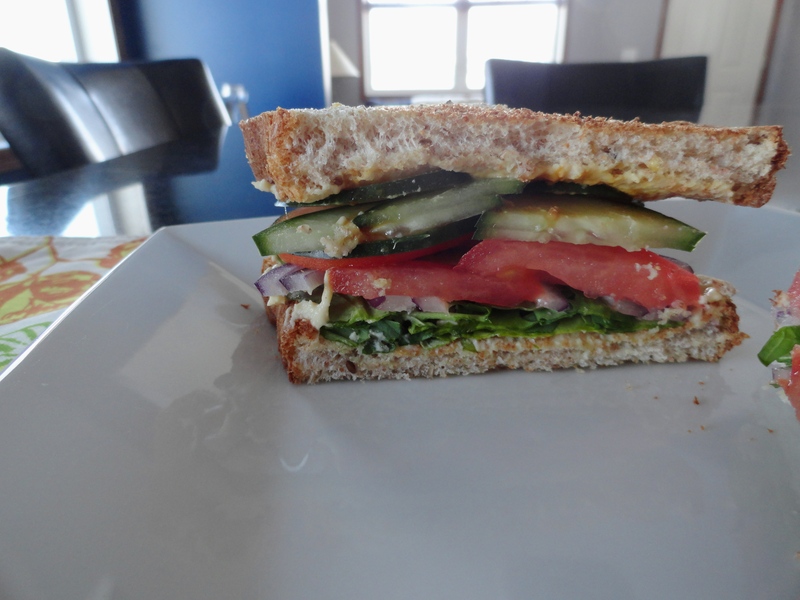 Layer one slice of bread with arugula, cucumber, tomato and red onion. Drizzle lightly with molasses and top with second prepared slice of bread. Who doesn’t love a sloppy joe? Certainly no one in this house. Unless it’s that gunk out of a can that rhymes with sanwhich. I’ve always used the same sloppy joe recipe since I was a kid, the one my mom would make, and it’s delicious. 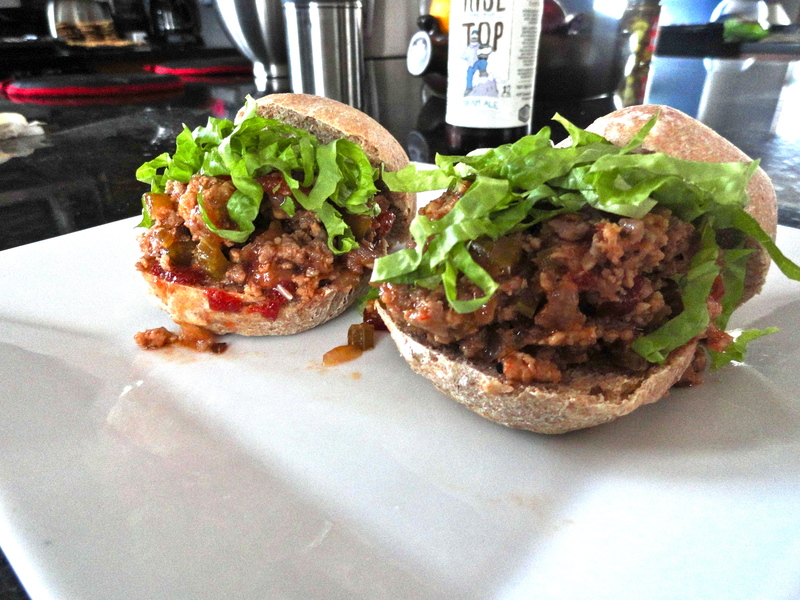 I had to get out of my sloppy joe comfort zone for one of my first recipe swaps, as I was given slow cooker sloppy joes. While those were good, we didn’t love them, and I really don’t understand the point of using a slow cooker when you basically have to precook everything anyway. I came across this recipe in Food and Wine a few months ago and have been wanting to try it. I actually had it planned for dinner a few nights, but you know how sometimes plans just don’t work out? Well, they didn’t. But, I finally got the chance to make a batch of these for a camping trip with my bestie, her husby, Nate and myself. We were in charge of one dinner and one lunch, so I thought this would be something easy, but different from the normal burger or brat that is a common meal while camping. I thought these turned out fantastic. At first, I thought I would need more hoisin, but after letting it simmer and taste testing it, I thought they were perfectly Asian. For serving, I wouldn’t mind a little extra Sriracha, but obviously it’s not for everyone. They went over really well while camping, and even the Asian approved! I love my mom’s sloppy joe recipe, but I have to say, this really takes the cake. The spicy pickles really kick it up a notch, adding a crunch, while the lettuce adds some extra freshness. Try these out for your next pot luck. You can come back and thank me later! 1. Heat olive oil in a large deep skillet over medium high heat. Add onions, celery, chile sauce, garlic, ginger and a generous pinch of salt and pepper. Cook over medium high heat, stirring occasionally, until the vegetables are softened, about 8 minutes. 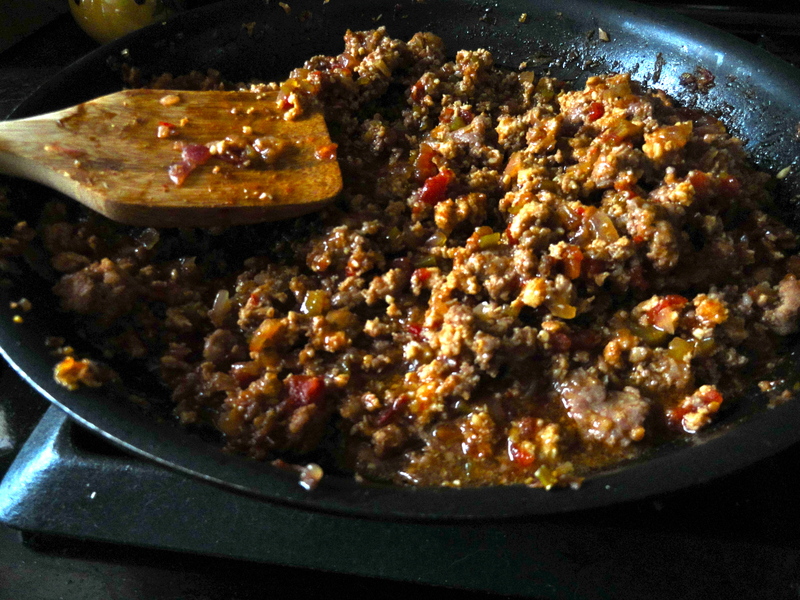 Add ground chicken and pork and cook, stirring occasionally to break up the meat, until no pink remains, about 5 minutes. Stir in hoisin, tomatoes and lime juice and bring to a boil. Reduce heat to low and simmer until thickened, about 20 minutes. Season with salt and pepper to taste. 2. Spoon about 1/4 cup of the mixture on the bottom half of each roll. Top with shredded lettuce, spicy pickles and top of bun and serve. I used to not like fish. I know, I can’t believe it either. But, now if I could afford to, I would eat fish every day. When I was young, I would dabble in a little fried fish every now and then, only because it was fresh and my dad caught it, and it was what’s for dinner. Finally, I grew out of my picky stage and realized how delicious fish is, especially my dad’s cracker crusted pan-fried walleye. But, we’re not here to talk about walleye, we’re talking about salmon. One of my first times trying salmon was at a place in downtown Minneapolis near my work. It was a fairly fancy seafood place, and I wanted to try to expand my horizons, so I ordered a salmon burger. It was so delicious. Granted, I did top it with tartar sauce, not knowing at the time it was weird – but it is. To this day, if I’m there for lunch, I’m likely to get the salmon burger. Too bad I don’t work in Minneapolis anymore. 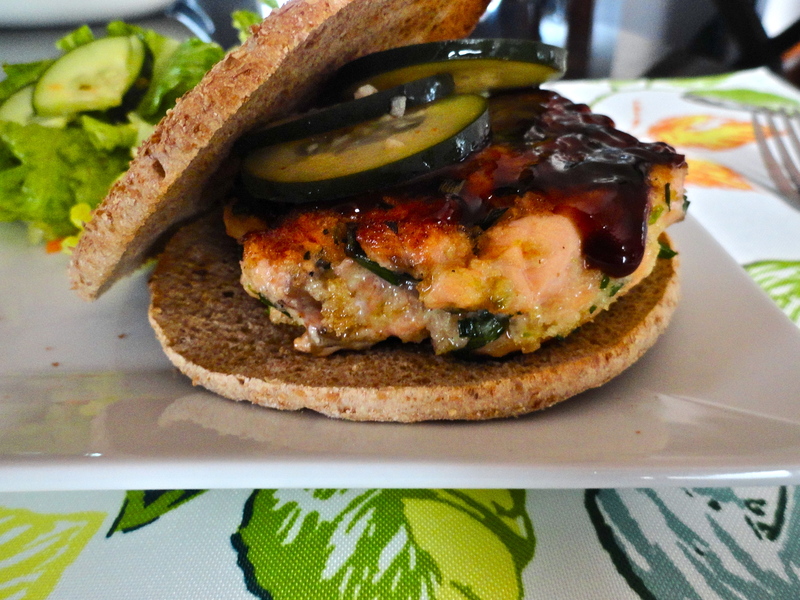 So when I saw Nicole’s recipe for salmon burgers, it took me back to my nearly virgin fish days. 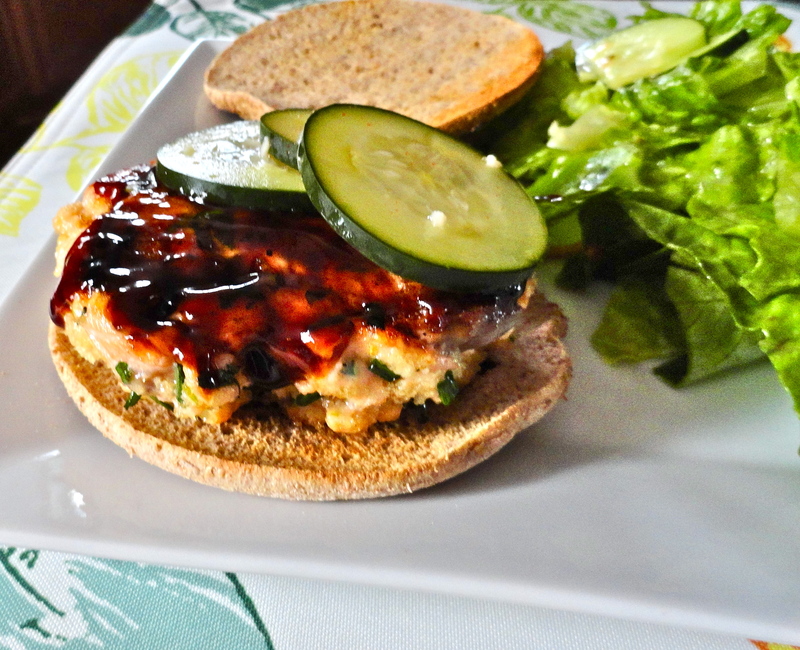 The flavors aren’t really similar, but I still wanted to try it because I love salmon, and I really like Asian flare, so the hoisin glazed salmon burgers sounded right up my alley. These came together so super quickly, and even better, tasted amazing. 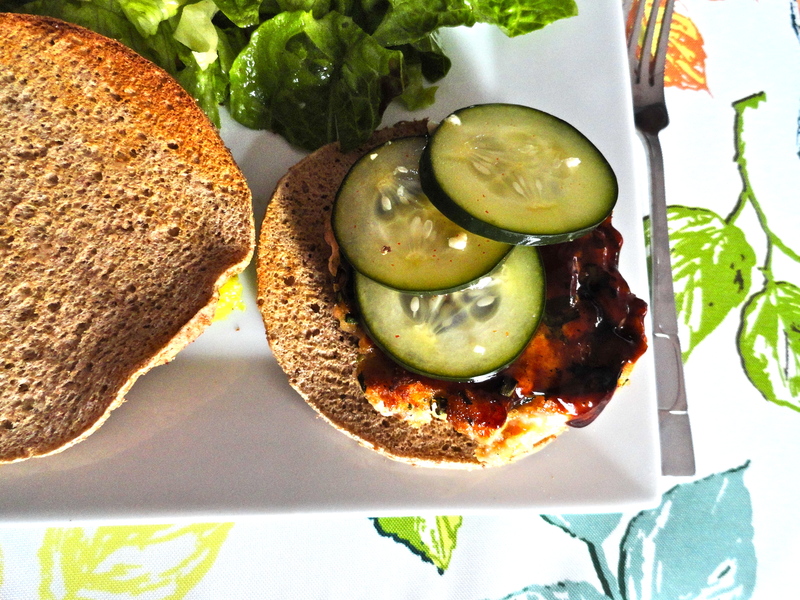 The pickled cucumbers on top really add a bang to the burger. It might also have to do with me adding a little extra cayenne pepper to the pickling juices. The burgers were firm enough that I might have been able to grill them, but I didn’t want to take the chance of them falling apart, so I used a cast iron skillet. The sesame oil added the perfect amount of nuttiness and wasn’t too overpowering. 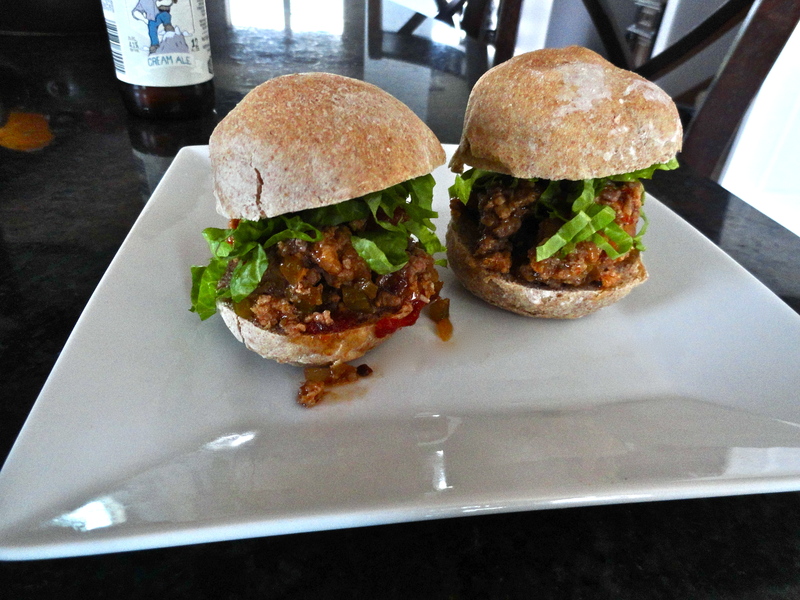 This is a great summer burger recipe and alternative to your average turkey or beef burger. 1. In a small saucepan, combine water, vinegar, garlic, ginger and cayenne. Bring mixture to a boil. Remove from heat and add cucumbers. Let stand for 30 minutes. 2. In a large mixing bowl, gently toss together panko, chives, cilantro, soy sauce, ginger, lime zest, salmon and egg white. Separate mixture into four equal parts and shape into patties. 3. In a cast iron pan, heat sesame oil over medium-high heat. Add two patties to the pan and cook for 3-4 minutes, until beginning to brown on the bottom, and flip. Cook for another 3 minutes, brush the tops with hoisin sauce and cook for 30 seconds more. 4. Place patties on bun and top with cucumbers and top half of bun.